Until 1970 Strome was a much busier place than it is today, for the main road from Achnasheen to Kyle of Lochalsh followed the north west side of Loch Carron from Lochcarron to a ferry which plied between here and Stromeferry on the far shore. 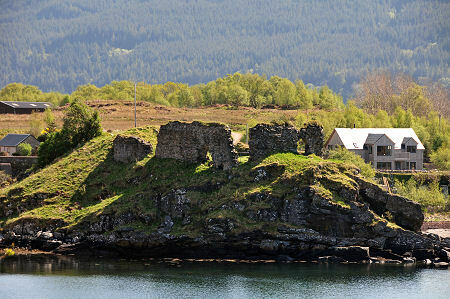 It is easy to imagine many of those waiting for their ferry exploring the nearby ruins of Strome Castle. 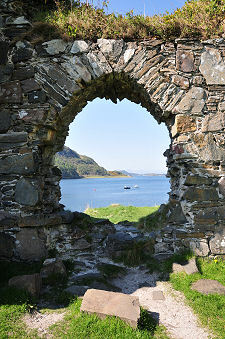 But the ferry disappeared with the completion of the Stromeferry bypass along the south east shore of Loch Carron to its head, and with it went most of the visitors to the castle. 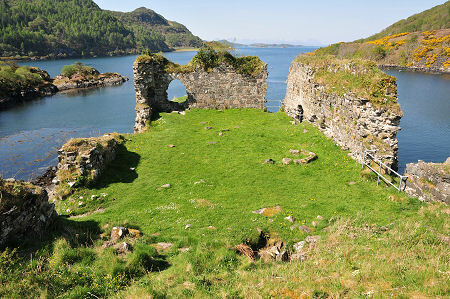 Strome Castle was built in in the 1400s. Its position is a strategically important one, guarding the north side of the Strome Narrows near the mouth of Loch Carron and the ancient ferry crossing here. And its position is also a commanding one, on a rocky bluff, surrounded by steep drops to the shore and sea on three sides. The information board shows a reconstruction that suggests Strome Castle was a tower house, looking a little like Invermark Castle, shown on this page. If so, it would have been truly spectacular in this location. 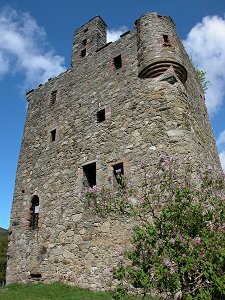 After a century or so in which the castle changed hands a number of times, it was granted by James V to the Macdonalds of Glengarry in 1539. For the next 63 years the Macdonalds intermittently fought to keep possession of it with their neighbours, the Mackenzies of Kintail. In 1602 the castle was besieged by Kenneth Mackenzie, Lord of Kintail. Mackenzie was on the point of giving up the siege when, one night, some Macdonald women drawing water from the castle's well accidentally deposited it in the barrel containing the castle's stocks of gunpowder rather than in the barrel containing their immediate supply of water. A Mackenzie prisoner in the castle overheard the argument that followed and in the confusion escaped to inform Kenneth Mackenzie that the castle was now effectively defenceless. The Macdonald garrison negotiated their surrender and safe passage. After they had departed, the Mackenzies blew up the castle, leaving it very much as you see it today. 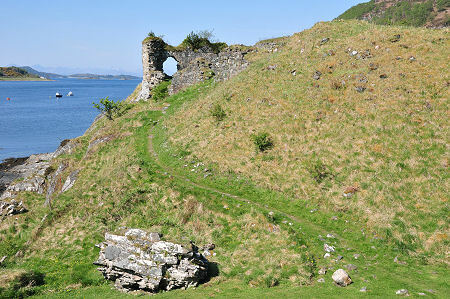 Strome Castle in its Prime?